How might we create empathetic & engaging design research methods? Research methods that are able to engage the target user to make qualitative & ethnographic discussions more real need to be carefully designed. Design research itself, is a way to understand what design outcomes and their details should be, but the same can apply to the design of research methods. I love simple qualitative interviews, and they're my go-to for the first round of research. As a follow up, to gain a deeper understanding, games and prop-led methods that are either explorative or evaluative of design outcomes can be used. In order to design research, it is important to have context and background information about the target users which can be gained through basic qualitative interviews , ethnographic research or prototyping. This method is excellent in getting a story within boundaries, from the target user. Figure out what you want to find out more about, divide that up into categories and make a list for each category. In this case, we were testing a product for the emotions it evokes in certain situations and contexts. Can be played with cards using illustrations (or words, for an educated audience). Get users to tell their story to the group, which opens up a discussion. To turn the method into a game, create scales on which the stories can will be rated, anonymously within the group. This game was prototyped in both, rural and urban contexts - works better with an educated target user group, especially to understand thoughts and emotions about communities/culture. This game format is primarily used to validate or negate hypotheses. A question comes with 3 potential answer choices. Players are alerted that while there's no right answer, it is in their best interests to answer according to "what others think" (a way to remove judgment/spotlight from the player in the hopes that they answer for themselves), because only if their answer is the majority answer, they get a point. 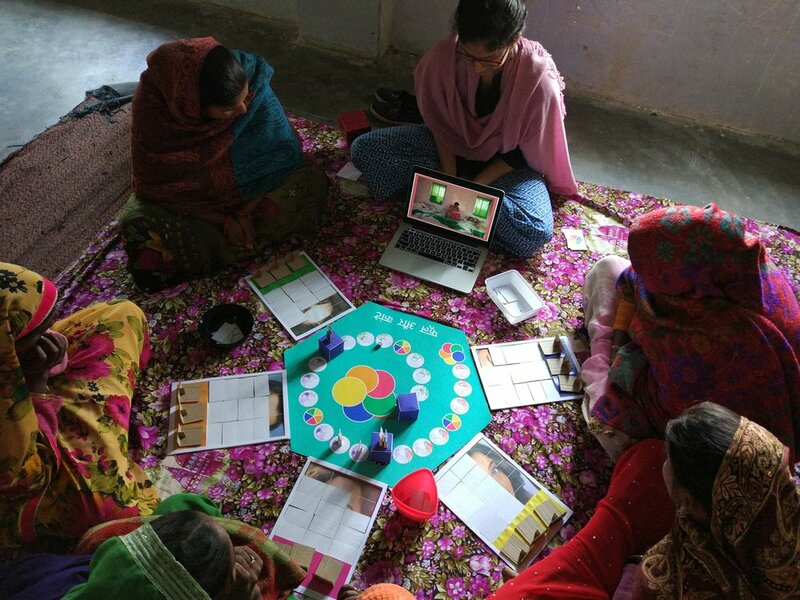 This particular board game is extensive (and had a long prototyping process which can be viewed here), because it was designed for rural women in North India, where women are typically shy to speak to strangers and have grown up with a strong teaching of always having the "right answer." The questions are overshadowed by design choices that are built in to increase empathy and comfort for the users. The illustrations on the board reflected the journey of a woman living in rural North India: marriage, pregnancy & parenting. To make the women feel more connected to the game, and to create a stronger connection between the board and the questions, the playful illustrations proved successful. Questions were asked via short films playing out each hypothesis in scenarios. Films were shot in surroundings that the women would relate to. Answers booklets provided the choice boxes in primary colors matching the video colors, and avoided any use of letters (in case of illiteracy among users). For the game anchors, the booklet border colors matched the counter colors. For a target audience that is poorly or not educated at all, does not deal with money, does not make decisions, has never played games before - for them, the concept of points and winning is insignificant. Creating an incentive that would engage the women was perhaps the most difficult part of designing this game. After several rounds of prototyping, the game employed a concept inspired by pareidolia. Each player was given their own board, covered with several little pieces of cardboard. Every time they gained a point in the game, they removed a piece from their board, revealing a photo (Bollywood actors). As the game moves forward, a missing eye or nose on the photo is meant to engage & incentivize the player to win the game. This strategy was somewhat successful in engaging the women, but we've got work to do on this part! In an attempt to simplify the board game devised for women, a new format was tested during a dental hygiene project. Also tested in North Indian villages, this game fared better because of its simplicity and a much more cohesive set of rules. Question and answer formats remain the same, this game cuts out counters and players gather points (in the form of coins) every time they roll an unrolled number and turn over a card on the board, following instructions on the back: includes questions & mini-games. For testing pilot interventions, ask a target group to divide an amount of money you provide to them on all the interventions that they have been exposed to. To make this more real, give them coins or currency notes. To make conversations more rich, ask them that they have to divide as a group (this is extremely effective in producing emotions, arguments, agreements and disagreements).